China's Yang Wei continued to dominate the gymnastics in Doha on Wednesday, sharing gold in the men's parallel bars to join compatriot Li Ning as the leading gymnastics medal winner at the Asian Games. Yang shared the prize with South Korea's Kim Dae-eun to win his record-equalling eighth gold at a Games. The medal was also a record-equalling 11th at a Games, although Li remains the most successful Asian Games gymnast by winning one more silver than Yang. Yang's latest gold was his fourth of this Games. He narrowly missed taking the record for medals outright in the last event of the day when he finished fourth in the horizontal bars. "It's finally over," Yang told China's Xinhua news agency. "Now I just want to have a good sleep. A holiday is even better. "Japan achieved very good results at the Athens Olympics, so we set them as our target to beat." 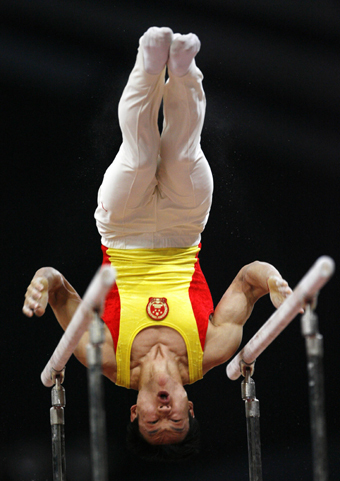 Across men and women, China won 11 golds in gymnastics. Japan won two. "Sometimes you win, and sometimes they win. That's competition," Yang said. In women's gymnastics Zhang Nan overcame an unsteady routine to take gold in the women's beam final, claiming an historic 100th gold medal in artistic gymnastics for China at the Games. Her score of 15.000 was the lowest winning score across all apparatus finals. Han Bing won the silver medal behind team mate Zhang, while Japan's Miki Uemura won the bronze. Zhang joins compatriot Chen Cuitling as the most successful female artistic gymnast at an Asian Games, with both gymnasts winning six gold medals. "I am very lucky to get this honour for China," she said. "I have never won a gold medal so special like the one I have won today."